Looking to make the most of a trip to the Andalusian capital? We’ve got you covered with the perfect itinerary for 2 days in Seville. Get ready for tasting tapas, beautiful ancient architecture, pleasant walks and the typical flamenco! Before you jump into the what to do in Seville guide, consider taking a look at all the experiences we offer at experitour.com. If you love history are culturally curious, this is the place to go. 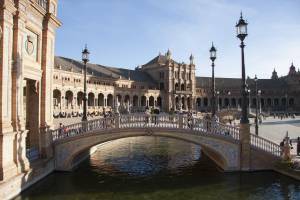 The experitour team spent a weekend in Seville and made a guide on how to best enjoy the city! Check out what we found out. How to start a better day if not having a traditional Spanish breakfast? We recommend Bar Santa Marta (Calle Angostillo, 2), which you’ll find in a hidden plaza right in the center! If you’d like to fit in with the locals, order a toasted baguette with fresh tomato and olive oil (tostada con tomate y aceite) with juice or coffee. Next to this great breakfast is one of the main attractions in Seville – the Real Alcazar. On your way there, walk up Calle Tetuan to enjoy fabulous stores along the way. Then, continue along Avenida de la Constitución, and marvel at the beautiful buildings until you reach Plaza del Triunfo. There you will find the UNESCO World Heritage Site, which is where you’ll find the entrance to the Royal Palaces, terraces and gardens. The waiting line is usually very long, the waiting can last at least an hour on busy days, since most people tend to buy the ticket at the entrance. However, we suggest you book in advance to skip the line and use all your time for wandering inside the palaces and gardens from the Alcazar. You can book a tour which includes the ticket and a private guide who will guide you inside the monument while explaining you all the interesting history of what you are seeing, at the language you choose. The visit last about an hour and yields great photos. Inside the gardens of the Royal Alcazar of Seville were recorded scenes of the worldwide phenomenon series Game of Thrones, during various seasons. It really is incredible. Check it out. You will be tired after walking over all the Alcazar. Now it’s the time for feeling all the Spanish tastes in your mouth with a tapas lunch! Head to the Arenal neighborhood for lunch! You could either opt for a more traditional sit-down meal or try tapas hopping—this area is ideal for both! Our favorite bars in the area include Casa Morales (Calle García de Vinuesa, 11), Bodeguita Antonio Romero (Calle Gamazo, 16) and La Taberna (Calle Gamazo, 6). After having lunch, keep the tradition and go for a siesta! Most of the businesses will close from 2 p.m. to 5:30 p.m. so you should really take a time for relaxation in your hotel. Night is a very active time in all Spanish cities. People get out for more tapas and for a beer. A great place for that is the Triana neighborhood. With its epic views over the city and its traditional streets, you will have a great time wandering around and finding the true Sevillian experience. Join the locals and have more tapas and a beer or two! Enjoy all the flavors and we are sure they will remain in your memory for the next years. 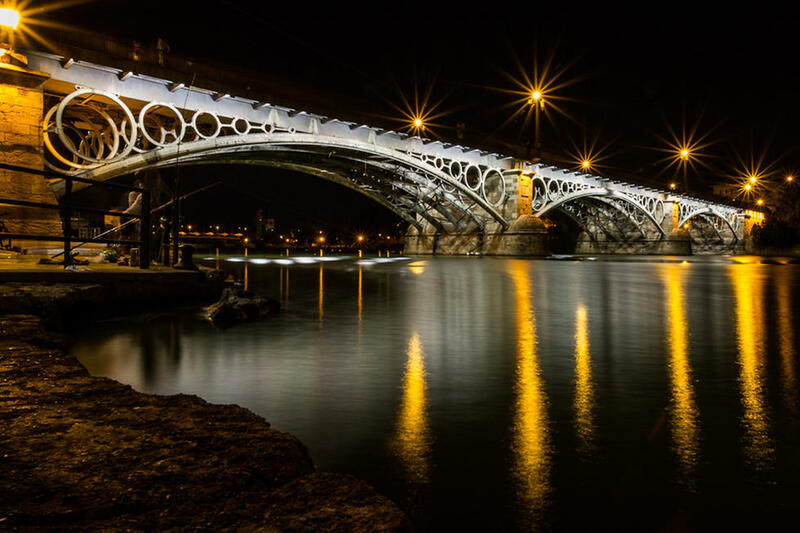 The romantic Isabel II Bridge is a charming scenery and is right in the entrance of Triana. If you have a love with you, leave there your love padlock. After a great night in the traditional Triana neighborhood, the second day must start again with a nutritive breakfast. You will walk a lot around the city so bring comfortable shoes and let’s go! 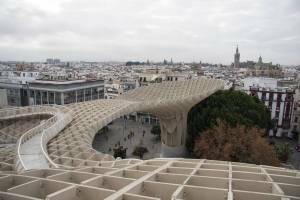 Metropol Parasol is an enormous modern wooden structure located at La Encarnación square, in the old quarter of Seville, Spain. It was designed by the German architect Jürgen Mayer and completed in April 2011. It has dimensions of 150 by 70 meters (490 by 230 ft) and an approximate height of 26 meters (85 ft) and claims to be the largest wooden structure in the world. Its appearance, location, delays and cost overruns in construction resulted in much public controversy. The building is popularly known as Las Setas de la Encarnación (Incarnation’s mushrooms). In any case, it is possible to climb the building and have a great view of Seville and its monuments. 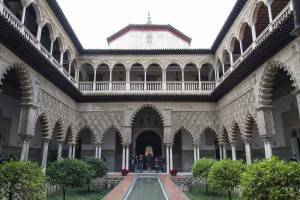 Located near the Real Alcazar, Seville cathedral is the 3rd biggest cathedral in the world. 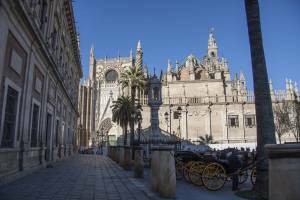 It is a Roman Catholic cathedral in Seville and is also a UNESCO heritage site. The cathedral’s construction lasted over a century, from 1401 to 1506. It is said that when the plans were drawn up, church elders stated, “Hagamos una iglesia tan hermosa y tan grandiosa que los que la vieren labrada nos tengan por locos.” (Let us build a church so beautiful and so magnificent that those who see it finished will think we are mad). A nice tip given us by a local is to see the church from the inside during the “missas” masses, in the many chapels inside the cathedral. In the same place you will find the Giralda tower, originally a minaret during the Moorish period. The tower is 104.1 m (342 ft) in height and remains one of the most important symbols of the city, as it has been since medieval times. It is also possible to go up the Giralda tower and have a really breathtaking experience seeing the city from up there. From its beauty and from all the steps. 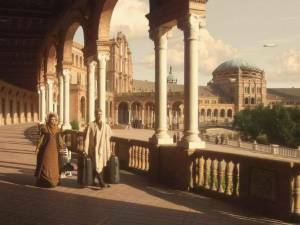 It’s now time to visit the beautiful Plaza de España. 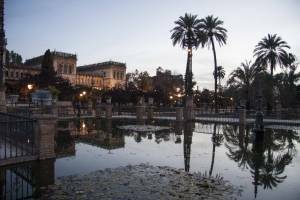 It is situated in the Maria Luisa park, that also includes other squares and nice spots. Built in 1928 for the Ibero-American Exposition of 1929. It is a landmark example of the Regionalism Architecture, mixing elements of the Renaissance Revival and Moorish Revival (Neo-Mudéjar) styles of Spanish architecture. There you can enjoy not only the architecture, but also live music played by street artists, watch flamenco dance and go for a boat tour in the lake. And if you are a big fan of the Star Wars Saga, this is the place where they filmed the movie Star Wars – Episode II Attack of the Clones. In the Maria Luisa park you will find the beautiful Archeology Museum and the Arts and Popular Costumes Museum, next to Plaza America. Both are great opportunities for wonderful pictures and learning. Just as tango is for Argentina, flamenco is for Spain and Andalusia. Every night there are shows of Flamenco around Seville. The passionate and traditional dance of this region is something you can’t miss. 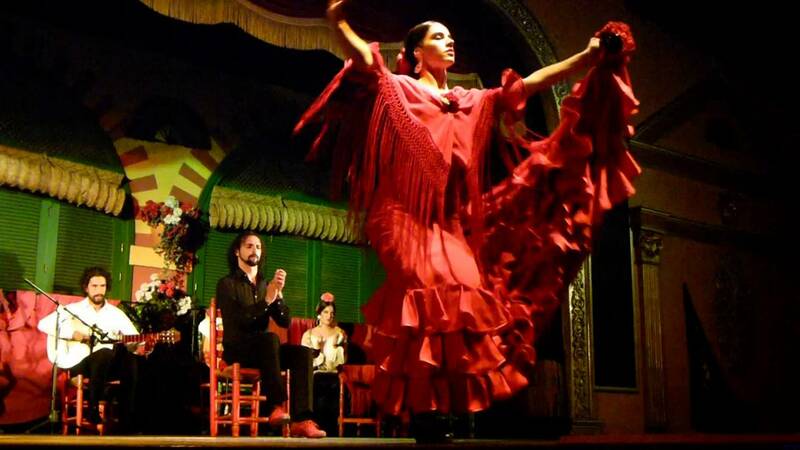 Go to the El Palacio Andaluz and watch the best professional dancers in the most typical tablao in the city center. They have an amazing adaptation of the Opera Carmen of Bizet. 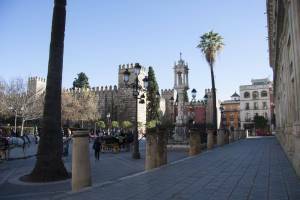 Now that you know how to best spend your time in Seville, don’t waste time and book your trip! For a better deal, book with us in advance some tours so you have the ultimate experience while staying in this amazing city. It will definitely be the experience of a lifetime. Post written by Letícia Melo. I absolutely LOVE Seville, my bf and I try to go there every year!